Native of Northern Africa, Asia, and Europe. Introduced in the United States; naturalized. Moist to dry. Prairies, pastures, abandoned fields, forest openings, roadsides, railroads, disturbed sites. Full sun. This is a 16″ to 78″ tall, erect, biennial forb that rises from a taproot and fibrous roots. The taproot is fleshy, thick, up to 28″ deep, and often branched. In its first year the plant produces a radiating cluster of leaves (rosette) above ground and a large taproot below ground. In the second year it sends up a single erect flowering stem, sometimes also one or more ascending side stems. The plant dies after flowering and setting seeds one time. It does not spread vegetatively. The seeds germinate easily but do not often survive. 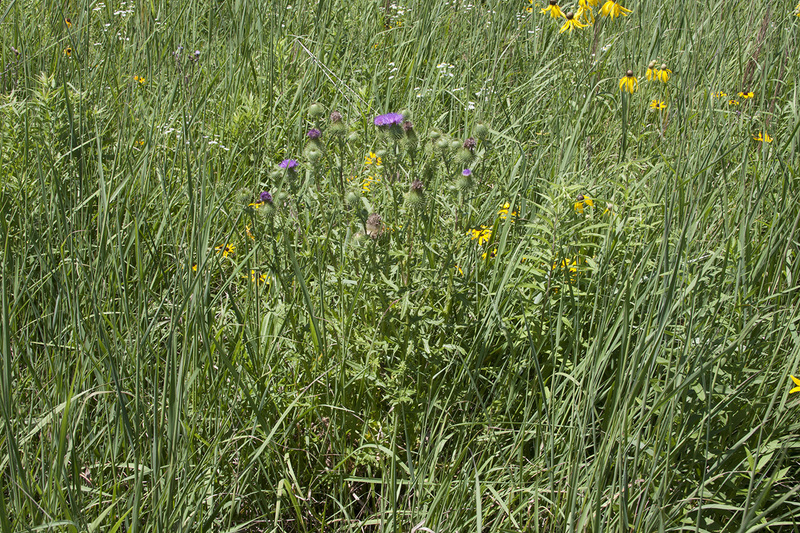 As a result plants are usually found singly or scattered. The stem is stout, usually well branched, and light green with dark purple veins. It is sparsely to densely covered with long, soft, spreading hairs, at least the middle and upper sections. The upper portion of the stem is conspicuously winged. The sap is clear, not white. 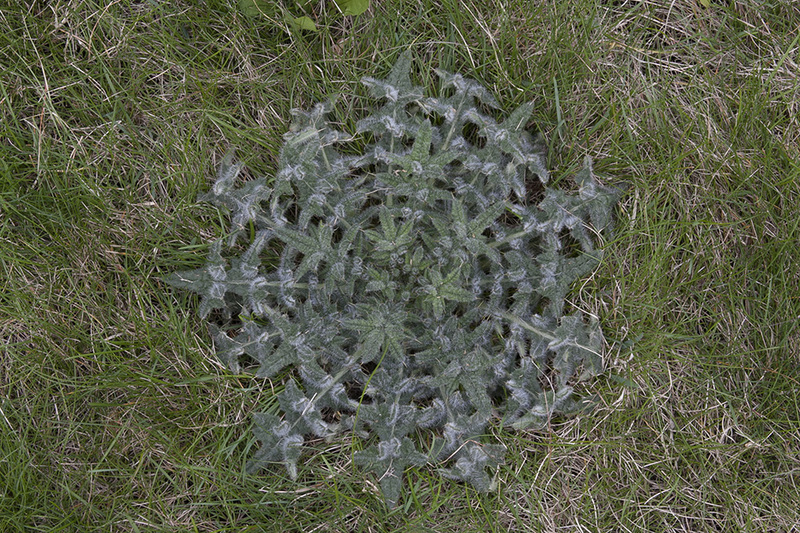 The rosette of basal leaves produced in the first year is flat and can be 24″ or more in diameter. The leaves are narrowly elliptic to inversely lance-shaped in outline, 6″ to 16″ long, and 1¼″ to 6″ wide. They are deeply cut into 4 to 6 widely spaced pairs of lobes (pinnatifid) with the lobes further cut into 3 or 4 smaller lobes (bipinnatifid). The ultimate lobes are rigid, triangular to lance-shaped, and tipped with a stout, yellowish, 1 ⁄16″ to ⅜″ long spine. They extend both horizontally and vertically from the plane of the leaf blade and are mostly twisted at the base to face toward the leaf tip, giving the leaf a distinct three-dimensional appearance. The upper surface is dark green with a light green midrib. 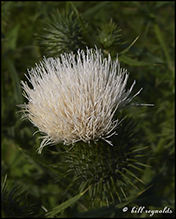 It is covered with short, straight, white hairs and small yellowish spines. The lower surface is lighter green and is covered with grayish, cobwebby hairs, at least along the veins. The leaves are densely hairy when young and become less hairy as they mature. The margins are spiny. Stem leaves are 1¼″ to 6″ long; stalkless and slightly clasping; and deeply lobed, cut more than half way to the midrib. The lobes are narrow, often linear lance-shaped. 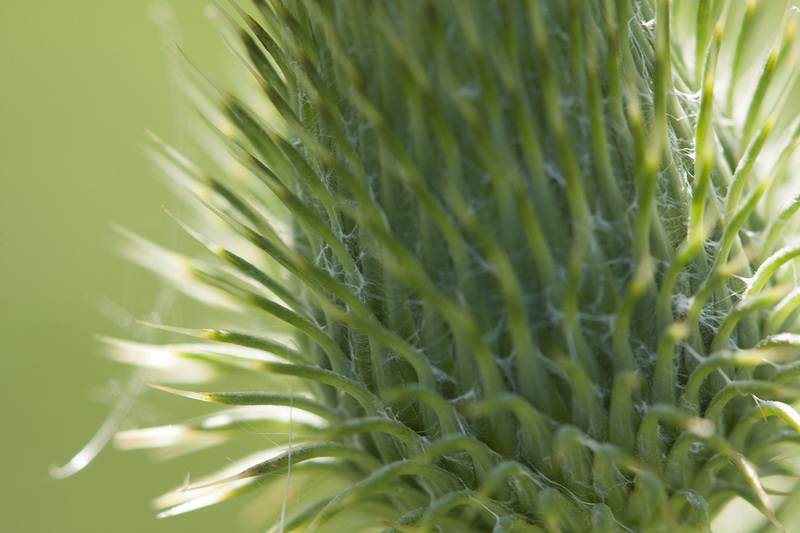 The upper surface is covered with stiff, bristly hairs, at least along the veins. Stem	leaves are	otherwise	similar	to	basal	leaves. 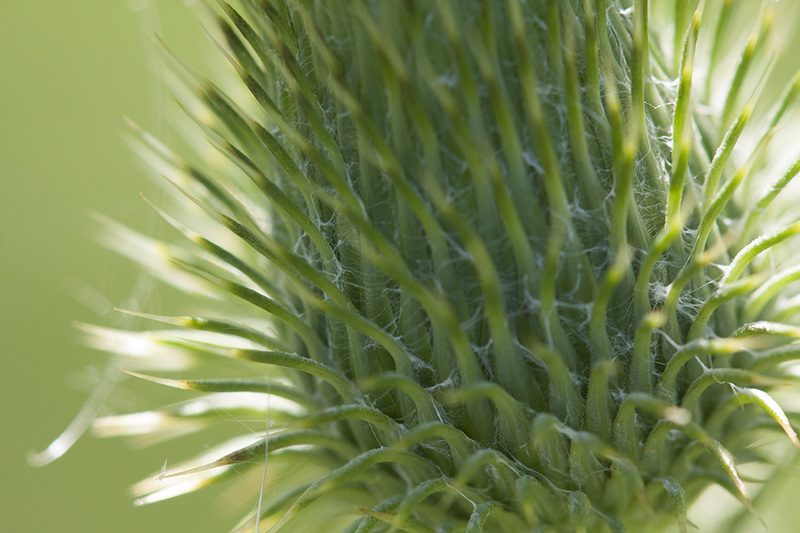 The blade of the leaf continues down the stem from the point of attachment as a wing that is up to ⅜″ wide. The margins of the wings are armed with spines up to ¼″ long. The wing extends uninterrupted nearly to the leaf below. Middle stem leaves are often more deeply divided than lower leaves. The leaves become progressively smaller but no less divided as they ascend the stem. However, some of the uppermost leaves may be lance-shaped or linear and not divided. The inflorescence is usually a single large flower head, sometimes a loose, branched, cluster (corymb) of 2 to a few large flower heads, at the end of the stem and each branch. 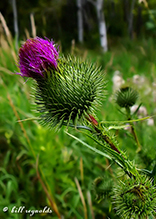 The flower heads are stalkless or are borne singly on ⅜″ to 2⅜″ long stalks. The flower heads are subtended by one to several straight, unlobed, linear, spine-tipped, bract-like leaves. At the base of each flower head there are 5 to 12 rows of numerous bracts (phyllaries) forming a hemispheric or bell-shaped base (involucre). 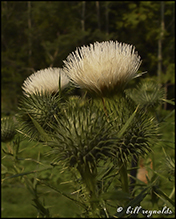 The involucre is 1¼″ to 1½″ long and ¾″ to 1½″ wide, slightly longer than wide. 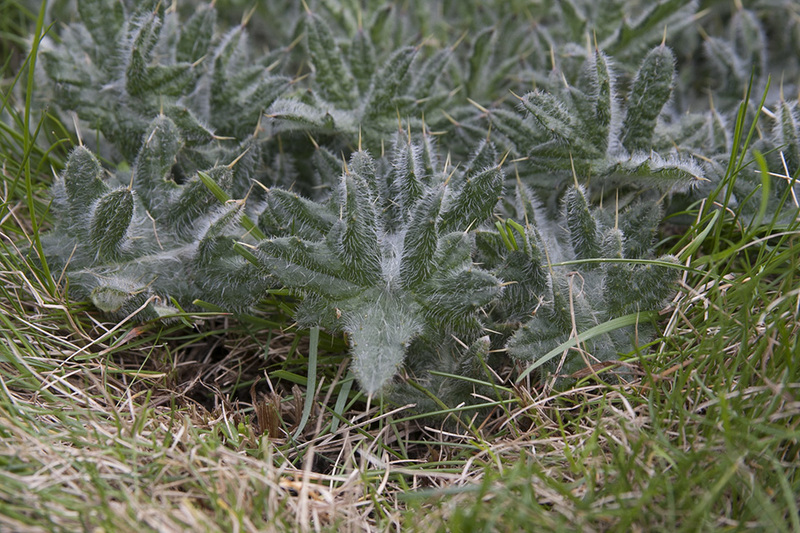 It is loosely covered with cobwebby hairs, at least near the base. The lower and middle phyllaries are linear lance-shaped, curve outwards, and are long tapered to a spiny, straw-colored, 1 ⁄16″ to 3 ⁄16″long tip. The inner phyllaries are linear. 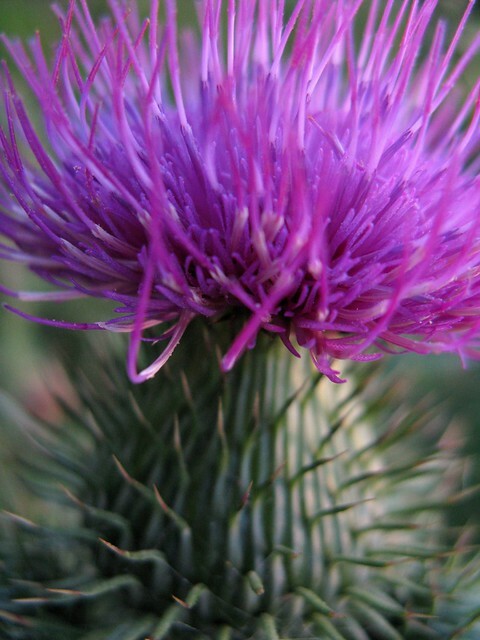 The flower heads are to 1½″ to 2″ in diameter. They have numerous tubular, 1″ to 1⅜″ long disk florets. The disk florets are reddish-purple or purple, rarely white. The fruit is a ⅛″ to 3 ⁄16″ long seed capsule (cypsela). The cypsela is light brown and sometimes has dark longitudinal streaks. The collar near the tip is inconspicuous. There is a tuft of white or light tan hairs at the tip. Distribution Sources: 2, 3, 4, 5, 7, 22, 24, 28. The exact date and location of this species’ introduction is not known. It is thought to have been introduced into North America by European settlers, possibly as a seed contaminant, in the early 1800s. 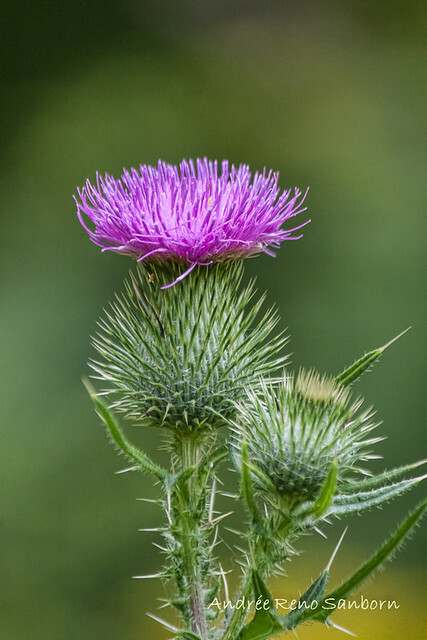 Bull thistle is a prohibited weed seed in Minnesota but it is not considered as serious a threat as other invasive thistles. 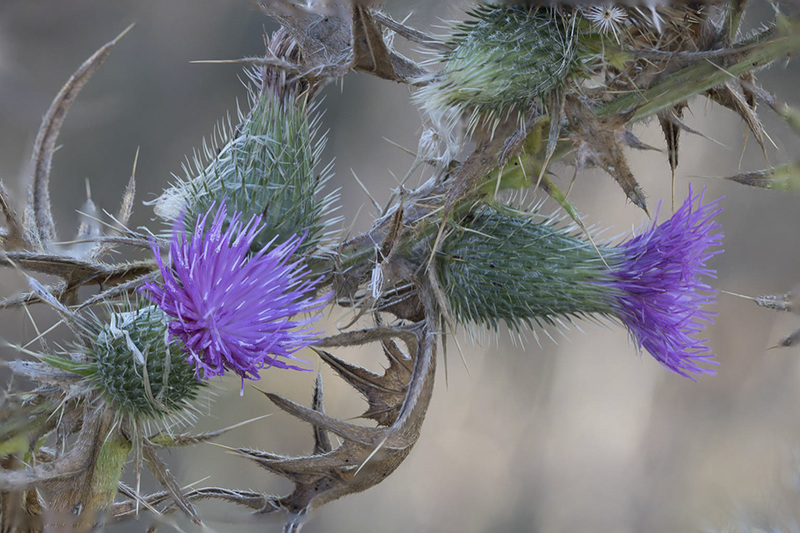 The spiny foliage makes it unpalatable to wildlife and livestock. It reproduces by seed only, not vegetatively. About 95% of the seeds germinate but few plants survive to maturity. Seeds that do not germinate in the first spring do not survive the following winter unless they are buried. Seeds that are buried at least 5 inches, as in cropland under cultivation, remain viable for only 3 years. A flat-topped or convex inflorescence in which the stalked flowers grow upward from various points on the main stem to approximately the same horizontal plane. The outer flowers open first. 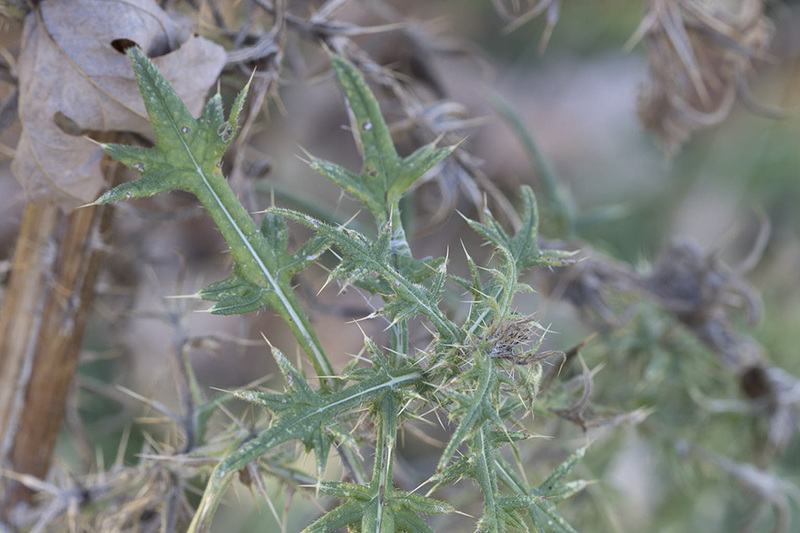 Here are two images of Bull Thistle just before bloom In Pennington Co. MN. 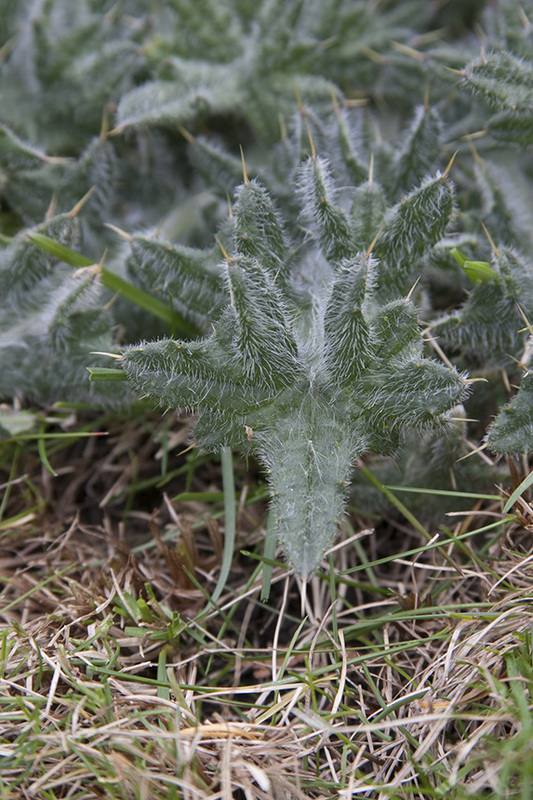 Introduced taprooted biennial often over 1 m tall, both leaf surfaces typically greenish and not covered by dense woolly hairs, upper leaf surfaces covered by minute spines or prickles, common where disturbance is frequent, such as roadsides and pastures. Bull Thistle (Cirsium vulgare), also known as Spear Thistle, in the East Kootenays of British Columbia. 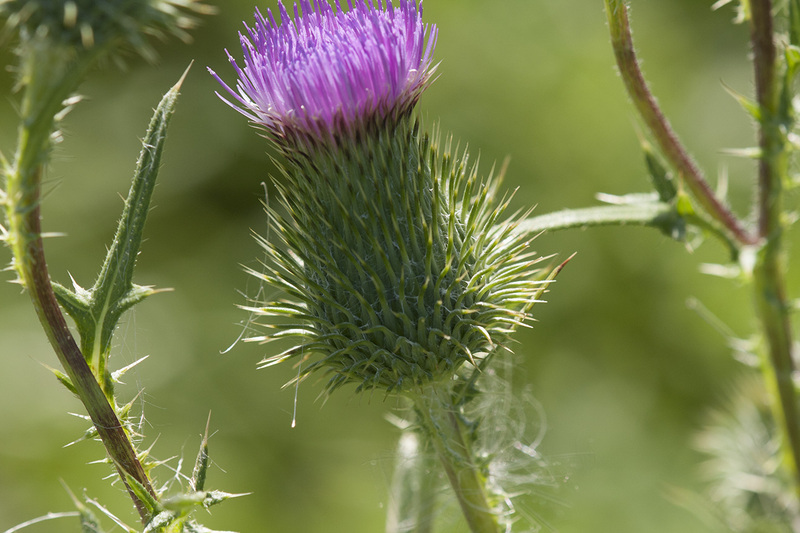 It is a native plant of most of Europe, Western Asia, and NW Africa. In North America and Australia it has become naturalised and is a widespread weed often found colonising disturbed ground. It is a member of the Sunflower (Asteraceae) family. The flowers are a favourite with bees and butterflies (and on this day, ants). Don't sit on this weed. 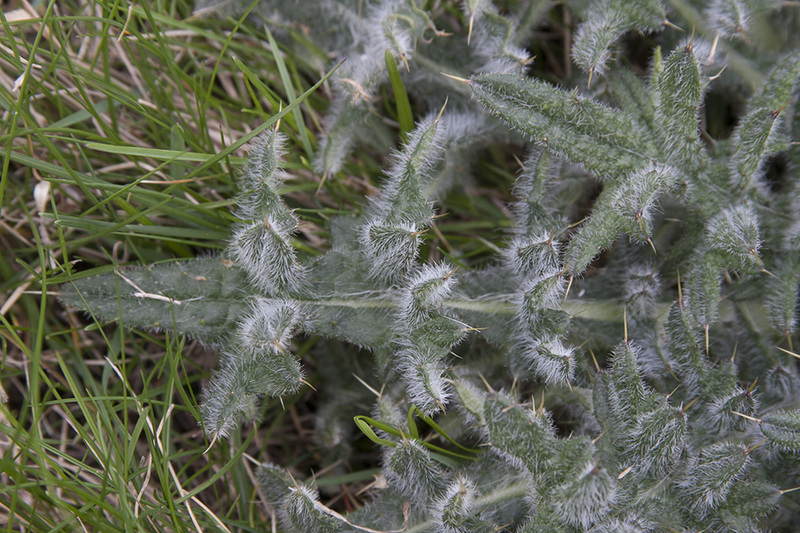 No, really, don't SIT on this weed. 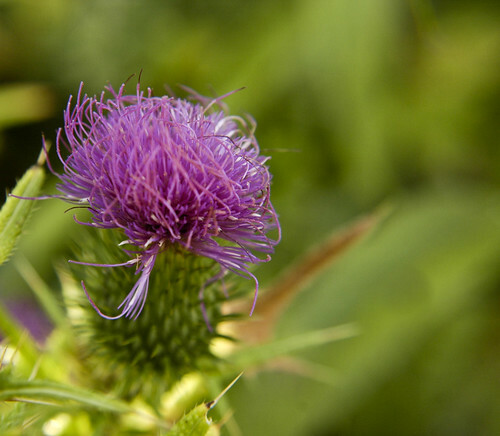 It's our Weed of the Week, Bull Thistle. 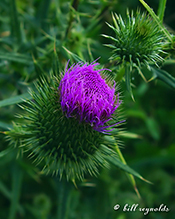 Cirsium vulgare (Spear Thistle) is a species of the genus Cirsium. 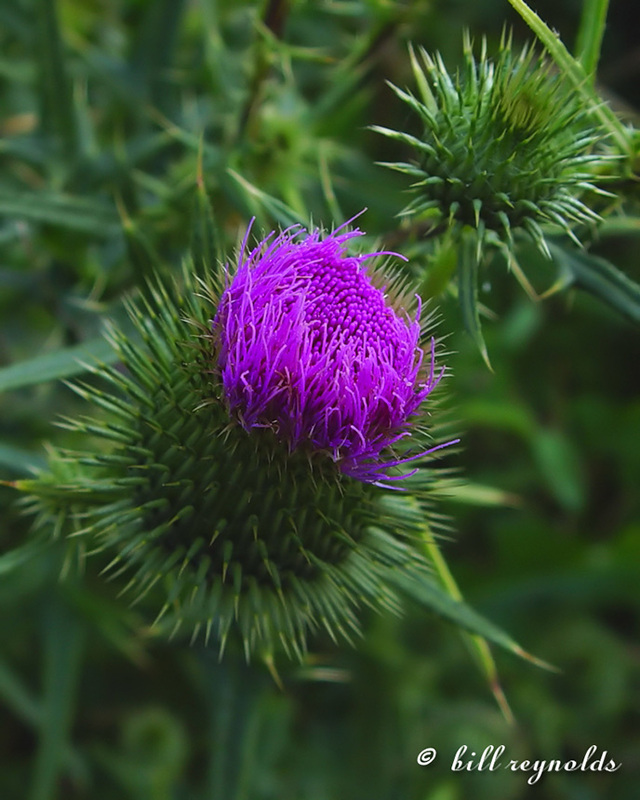 De speerdistel (Cirsium vulgare, synoniem: Cirsium lanceolatum) is een plant uit het geslacht vederdistel. I didn't know these existed. 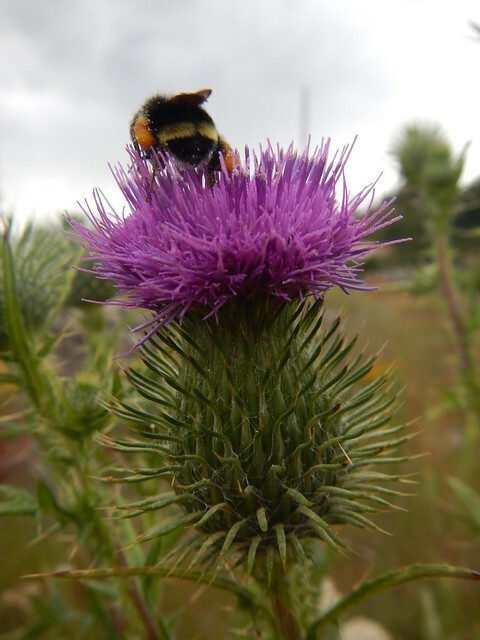 The Bull Thistle is just starting to bloom here in the north west of Minnesota. The first two open are white. 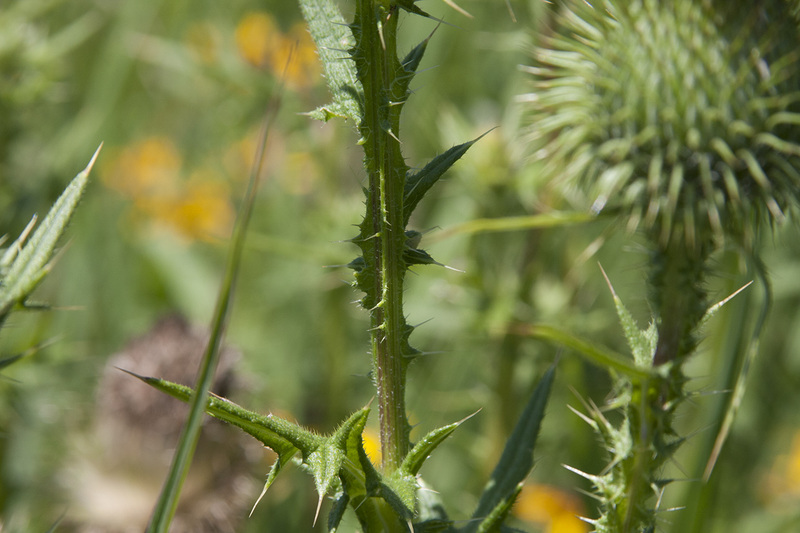 Bull Thistle just before bloom In Pennington Co. MN.